This is the best ever funny and amazing cats compilation of cats alarm clock trying to wake their owners in the morning. Now days people do not use alarm clocks to wake up in the morning, most people rely on their cell phones. But this time in this video cats are doing job of alarm clocks and cell phones. Their masters are still asleep in the bed and cats are waking them up gently by rubbing their noses and licking their heads. These cats are really cute. I am sure after watching this video even you guys will love to raise cats at home. You will love cats waking you up in the morning instead of alarm clocks. This funny compilation was uploaded on YouTube few months back. Thought it has not racked up millions of YouTube views but still it’s an amazing and watchable compilation. Cat alarm clocks are the best alarm clocks because alarm sound can irritate you early in the morning but this will not happen in case of cat alarm clocks. In the beginning you can see a man is lying on the bed and his pet cat comes and tries to wake him up by rubbing it’s paw on his master’s nose. 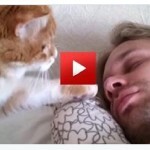 When the man wakes up, he smiles after seeing this action by his cat. The cat is doing this very gently and softly. Cat is not harming his master at all with it’s paws. In few other clips the cats are doing the same and using the same method to wake their owners. But one cat is different from others. It jumps over the man and wakes him up. And cute thing is when the man wakes up, he shocks the cat and the cat gets scared for a while. Few cats are licking their master’s heads. Beautiful music has been used as background music. As i have studied about cats, cats are more active in the morning time. In the day time even they fall asleep. Thanks for watching this funny cats compilation and i hope you guys enjoyed it.